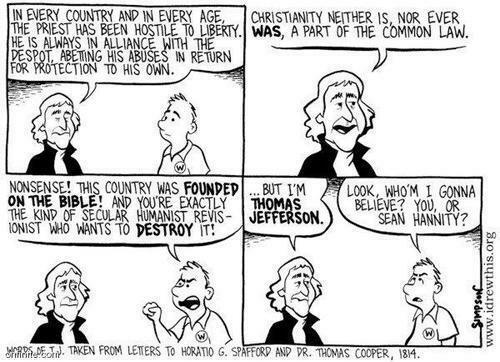 "This country was founded on the belief in one true God." Mono-theism was not a consideration whatsoever in any part of North Americas 'discovery' or establishment. It was completely for financial reasons. Well before the Pilgrimage of the Puritans in late 1620. The Eastern portions of North and South America were dotted with French and Spanish settlements / encampments starting in the early to mid 1500's. This countries history does included events that included pious individuals and groups... But that is about it. The Plymouth colony was made possible, because of (you guessed it) its potential financial gain by English business men. This arrangement was VERY successful... All was fine until the Revolution against England. This revolution laid the ground work for what is now one of the most powerful Nations on the planet. Even the revolution was motivated by money / taxes... Not mono-theism. These are the founding fathers of our country inasmuch as it was their minds, perspectives and intellect that created the documents used to create its government.